You are at:Home»Society»Crime»January 4, 1903: Killer Elephant Topsy Executed in Filmed Spectacle! On January 4, 1903, Thomas Edison’s company filmed the execution of Topsy the Elephant, the largest purported casualty in the “War of the Currents”! The big argument over whether to use alternating current as championed by Nikola Tesla and George Westinghouse or direct current as championed by Thomas Edison had already been decided in favor of alternating current a decade before Topsy became an afterthought and legend of the Current Wars. Digging deeper, we find Edison, the most prolific inventor of all time (electric light, phonograph, motion pictures, etc.) had been engaged in a bitter struggle with rival inventor and entrepreneur George Westinghouse over how the United States would be serviced with electricity. 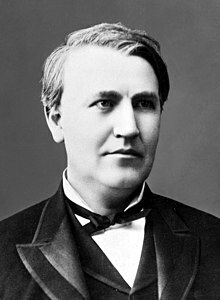 American inventor and businessman Thomas Edison established the first investor-owned electric utility in 1882, basing its infrastructure on DC power. Edison favored direct current (DC) and Westinghouse favored alternating current (AC). Each system had advantages, and Edison’s initial use of DC was the most logical choice at first, but advancements in AC transformers clearly made AC the more practical system. The decisive advantage of AC was the ability to transport electricity across long distances at high voltage and then use step down transformers to send lower voltage electricity into houses or factories. The DC system required that power plants be located within 1 mile of the customer, a totally impractical proposition. 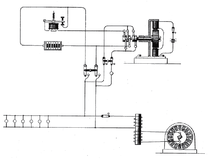 Westinghouse early AC system 1887 (U.S. Patent 373,035). So why did Edison persist in pushing so hard for a DC-based electric grid? And by pushing hard, we mean secretly being behind the development of the electric chair to “prove” how dangerous AC current is and distributing images of various animals being electrocuted by AC current. Indeed, with good reason, Edison, although a genius, has been declared a “shockingly” horrible person! Edison so desperately advocated DC current for one reason: Money! He held many patents for DC electrical devices and was heavily invested in its widespread use. He stood to gain millions of dollars if DC was the accepted system, and conversely he stood to lose millions if AC was adopted. Direct Current (red line). The vertical axis shows current or voltage and the horizontal ‘t’ axis measures time and shows the zero value. Diagram by Zureks. Edison even tried a smear campaign, and tried to “invent” the word “Westinghoused” to mean electrocuted. Topsy, a circus elephant that had killed 3 people and was “condemned” to die by execution and the circumstances of her death later became an apocryphal legend of the Current Wars, though a false one. The question of electrical transmission had long been decided, and Edison was not involved in the eventual killing of the rogue elephant, but in popular culture the legend developed that Edison had engineered the execution of Topsy as a demonstration of the dangers of alternating current. This sad event has been used in an incredible number of films, music videos, books and even TV cartoons! Perhaps the most cracked thing of all about this incident was that the executioners ensured that poor Topsy was given a large dose of cyanide poison prior to the electrocution! Topsy, standing in the middle of press photographers and on-lookers, refusing to cross the bridge over the lagoon to the spot where she was supposed to be killed. She eventually had to be wired up where she stood. Did we mention Topsy was originally going to be hanged? The plan evolved into a scheme to use an electric winch tightening a rope around the poor creature’s neck, but this evil plan was averted by protests of the ASPCA. Electrocution was chosen as a more “humane” alternative method of executing the pachyderm. The film clip of the cruel execution of a beast that had been treated poorly her whole life became a part of popular culture years after the event and the tale of poor Topsy becoming a victim of Edison’s evil maneuvering to discredit alternating current grew to accepted “fact.” (Even this article was originally prepared using sources that perpetuated the false narrative and has been updated in July of 2018 to reflect the real story.) Using the Topsy story as an example, it is easy to see how History can be changed and molded to fit a false narrative if we are not careful. Question for students: What other egregious examples of “true” historical stories that are actually false can you think of? Please share your thoughts about those incorrect narratives you find most annoying. Daly, Michael. Topsy: The Startling Story of the Crooked Tailed Elephant, P.T. Barnum, and the American Wizard, Thomas Edison. Atlantic Monthly Press, 2013. Marriott, Emma. They Got It Wrong: History: All the Facts that Turned Out to be Myths. Reader’s Digest, 2013. Winchell, Mike. The Electric War: Edison, Tesla, Westinghouse, and the Race to Light the World. Henry Holt and Co, 2019. The featured image in this article, a press photograph from a January 4, 1903 electrocution of Topsy the elephant in an event to raise publicity about the opening of the new Conney Island amusement park “Luna Park” (at this point still under construction), is in the public domain in the United States. This applies to U.S. works where the copyright has expired, often because its first publication occurred prior to January 1, 1924. See this page for further explanation. The photograph was taken just when 6600 volts of electricity was turned on. Behind Topsy is the bridge over the lagoon of the “Shoot the Chutes” ride to an island in the middle. On the island is the unfinished “Electric Tower” with a sign advertising “OPENING MAY 2ND 1903 LUNA PARK $1,000,000 EXPOSITION, THE HEART OF CONEY ISLAND”, and “FOUNDATION OF 200FT ELECTRIC TOWER” in the background. Previous ArticleJanuary 3, 1944: Medal of Honor Marine, Pappy Boyington, Shot Down during World War II! Next Article January 5, 2000: UFOs Sighted Over Illinois By Multiple Police Officers!